Since I published a book, one with professional edits, an ISBN number, and awesome graphics, I am more aware of everything about books. I now know every single word, space, punctuation mark, and blank page has been thoroughly scrutinized, changed, changed, changed, and then changed again. The front cover graphics, back cover summary, and the book title have been on somebody’s mind for weeks, maybe months, maybe years. Someone has even labored over the color and weight of the paper and book dimensions, price, and category. There is also the author picture and bio that doesn’t magically appear. I have a lot more appreciation for the total book, not just the contents. I was mortified when I first heard a book was going to be destroyed. Today, it happens all the time; libraries need to clear their shelves, and book distributors run out of space for unsold books. Still, the reality makes me shutter. 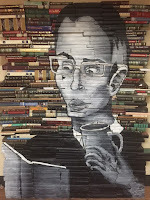 Repurposing books into art must have originated by someone, like me, who could not bear the thought of books being burned or shredded. It seems more humane and gentle to find a new way to use and enjoy the beauty, smell, and feel of abandoned books, without the need to eliminate them. The creativity displayed in book art astounds me. It is nearly as unique and expressive as the text itself. I have two old books sitting on my self waiting for an idea to land on my head so I too can design a unique work of art. Something to take me away from my keyboard, keep me surrounded by the written word, and to help memorialize, so to speak, the world of books; beautiful hardbound treasures. Bisbee, AZ sponsors an annual Altered Book event. Every year, the creativity surpasses the previous year. It is a great example of thinking outside the box, or better yet, making a box, or wall hanging out of a book. Having a love affair with books is a good thing. Whether it is holding one I write, paying for a shiny new one, searching for out of print titles, or attacking one with saws, scissors, and folded pages, books enrich many hours of my life. For all of us who write, involvement in a timeless endeavor to create, enjoy, and preserve the life of books is honorable. 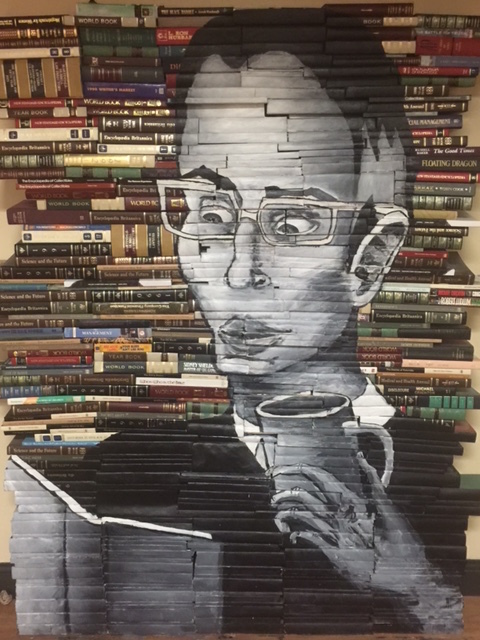 What book art have you done? I would have to say I've done no book art. Altho, we unearthed old art projects from the late sixties, and discovered a book cover (assigned) of "Diaries of Anne Frank". Long ago, and can't judge its worthiness. The Laramie County Library offered a book art class last year. In addition to making your own book, we also took an old book and turned it into a succulent planter. The spray glue about killed me and then I managed to kill the succulents because I couldn't ever remember to water them. So much for altered book art.